Fashion week's streets so far have been nothing if not surprisingly casual. Never before have we seen the likes of (the usually glossy) Miroslava Duma looking so very dressed down. 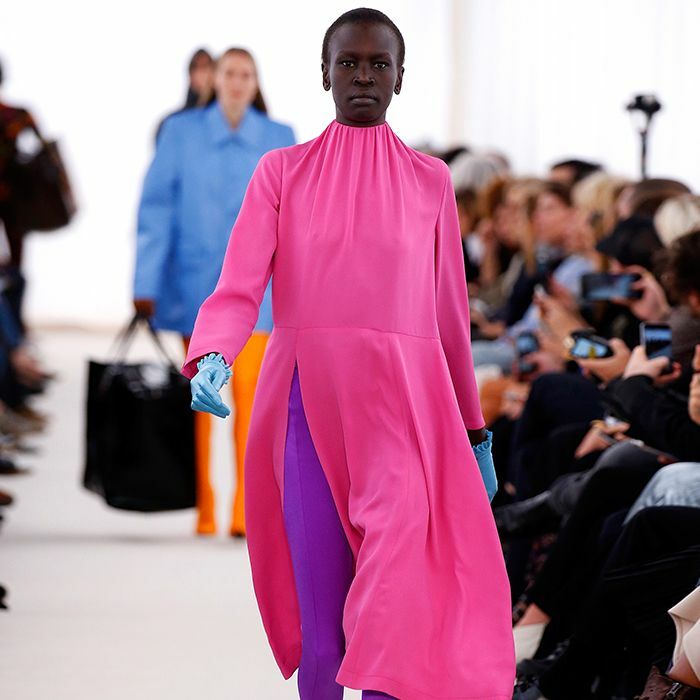 Call it peak Vetements—with the number of hoodies, puffer coats and sporty pieces on show, this brand's effect can be felt far and wide—but the look is even more laid-back than the runway's directional offering. We've been trying to find some reference points, and all style roads lead back to… dads. Yes, papas everywhere have become a fountain of fashion inspiration. The dad-trend movement has been gaining traction over the past year. 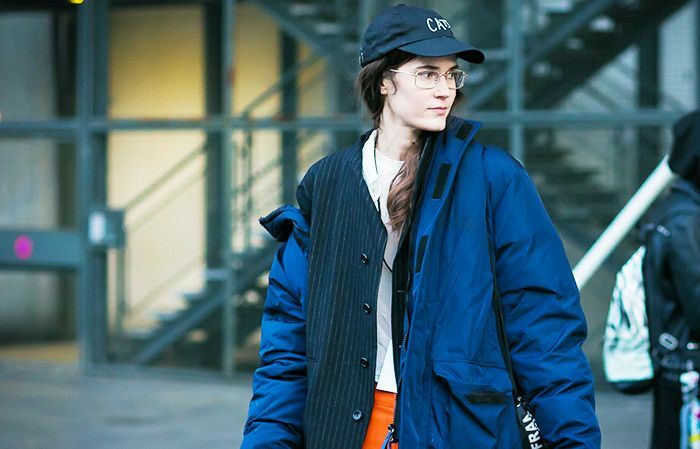 So even before the padded jackets and anoraks of Balenciaga and Vetements took to the main stage (or creative director Demna Gvasalia decided to put actual dads on the runway), the most directional girls in the world were swapping floppy hats for old-school logo-emblazoned snapback caps—the kind that are dished out at an engineering company for the team to wear on Dress Down Fridays, or picked up at a Patagonia shop before a hiking holiday. Then came Gigi Hadid and co. adopting white, chunky '90s-style sneakers: This is dad fodder of the highest order. And it rumbles on: From anoraks to shell suits, straight-leg jeans to giant spectacles, "dad" fashion trends are omnipresent. But what does a real dad think of them? I got in touch with Mr. Almassi to find out, his first response being: "FINALLY! As I said before—I don't follow fashion, I make fashion!" he tells me over email, "Dads are fashion icons. A real cool dad doesn't need Ralph Lauren or Tom Ford or Kenneth Cole to tell him what to wear—he has an instinct for it!" Keep reading to see what my dad thinks of fashion's new obsession. On Miroslava Duma: Nike Cortez Trainers (£65). "White trainers. Always faithful and always there. You couldn't live without them—comfy and cool." Swot up on the ways you can keep white sneakers looking clean at all times. On Ece Sükan: Balenciaga jacket. "Dad's second skin! The famous anorak—dads could do anything in them: Play golf, go to the DIY shop, go to the restaurant… You name it, dad would wear it for about six months of the year. Comfy and durable." See how to make the dad jacket trend work IRL. On Edie Campbell: Hiller Bartley bag. "You just can't beat a pair of blue jeans with black shoes and a dark navy jacket complemented with either a white or light blue shirt. Simple but cool. Eighties dads were brought up with real music, such as Barry White or Marvin Gaye, and they knew coolness was not just something you wore but the way you carried yourself." See the rigid straight-leg jeans that fashion girls are buying now. On Jan-Michael Quammie: Burberry trench; Kith track suit; Jil Sander bag; Céline shoes. "This dad was never keen on tracksuits—they were very mumsy and looked totally uncool. I don't think they will ever come back in fashion." Interested? Then see how to wear athleisure to the office for a smarter spin. On Miroslava Duma: Patagonia hat; Gabriela Hearst bag. "Baseball caps are more for the '90s dads—They are okay, but you need to choose the right one that suits your head. The '80s dad would not be seen dead in them—not cool enough!" ASOS has the best selection of these nerdy baseball caps. On Beatrice Gutu: Levi's jeans. "TOP GUN! Dads needed to have these glasses to go with their jeans and jacket—perfect combo!" Celebrities are already into this one—see who is wearing geeky glasses and how they're styling them. Next up, all the of the best street style looks from NYFW.